Our goal is to develop an emulator for the Burroughs B6700 system. We need help to find a complete release of MCP software for the Burroughs B6700. If you have old magnetic tapes (magtapes) in any format, or computer printer listings of software or micro-fiche, micro-film, punched-card decks for any Burroughs B6000 or Burroughs B7000 systems we would like to hear from you. B6700 software restoration - recover ALGOL, ESPOL, MCP and Intrinsics. B6700 front-panel replica - along the lines of the B205 project design and construct a replica of a main processor control panel. Burroughs machines in Tasmania - Discover and identify - UTAS had both a B6700 and B6800(?) in the Computing Centre and a B1700 in Administration. Savings Bank of Tasmania (SBT) had a B6800 (to be confirmed) and later an A-series system (Unisys). The University of Tasmania Computing Centre operated a Burroughs B6700 mainframe as a replacement for the previously long-running Elliott 503 jointly operated by the Hydro Electric Commission and University. The B6700 operated on a double clock cycle, a low-speed for the multiplexor and non-arithmetic instructions, and a higher clock speed only for arithmetic instructions. The low-speed was either 2.5MHz or 5MHz, with the latter the most common. The arithmetic instructions ran at 5MHz or 10MHz. The speed settings could be changed in the field when the customer paid for the upgrade. Memory cycle time was one of 0.5 usec, 1.2 usec or 1.5 usec. This is an attempt to reconcile various statements made about Burroughs "large systems" models which were released, renamed, superseded or omitted and so on. For example, the wikipedia page does not mention the B5900 despite the linked article at the bottom of the page to a long description from the "father of the B5900 System". 1965 Essentially the B5000 with disk instead of drum and improved software. B5900 1980 First E-mode implementation (consolidation of all the previous models instruction sets) implemented loadable microcode. Had 4 Display registers D, D. D, D[LL], where LL refers to the current lexical level. B6900 1980 Last of the "E-mode" machines implemented in hardware, 99% compatible with the E-mode design. The B6700 Display Panel is a somewhat complex arrangement of overlays as most of the panels above are shared between CPU and IO processors and different control groups (Memory Controller, Arithmetic Controller, Interrupt Controller etc). The Display Panel (DP) consists of switches, lights, and combined switch-lights (illuminated push button switches). Most of the bits within registers are combined switch-lights so the state of a register bit can be both seen and manipulated from the DP. Apparently, when operators were bored and the machine was hopefully(!) not busy a popular game was to play russian-roulette, pick a random register bit, flip its state and see how many times bits can be changed before the machine crashed or DS'd (discontinued) a job. X register (51-bits) - X is an extension word for A when processing double-precision operands. Y register (51-bits) - Y is an extension word for B when processing double-precision operands. 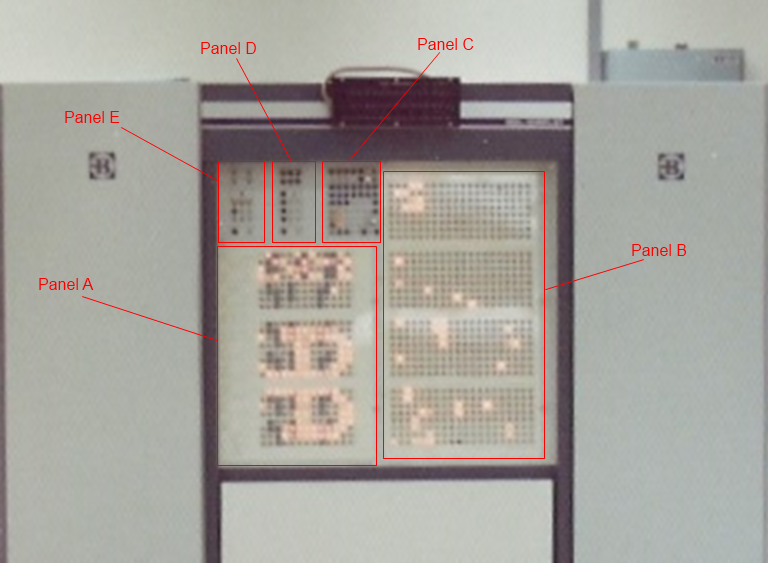 An interesting feature of Panel A due to its display of the TOS registers, when the CPU was idle the MCP arranged the bit pattern to appear in the TOS registers to display a large letter B (for Burroughs) as can be seen in the picture above. This letter "B" would flicker on and off (replaced with other patterns of lights) as the MCP switched between idle and busy states. Burroughs Model III B6700 processor with vector mode hardware, 196k words of main store, 4 pack drives etc with MCP Version 11.8 - from: Pascal User Group Newsletter (PUGN) #6, Letter from AJH Sale, dated 8-Nov-1976 - as the machine was commissioned in late 1975 this configuration is likely close to what was initially delivered. Configuration details of the UTAS B6700 still to be determined.